Many growers ask us about the Lumen output of our full spectrum LED grow lights. Lumens is a measure of how bright a light will appear to the human eye, not how well a light will grow plants. Trying to rate a LED grow light by its Lumen output will not accurately describe the growing ability of the LED grow light. 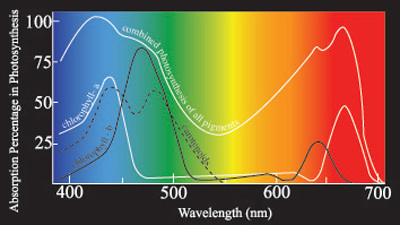 LED grow lights target specific wavelengths of the light spectrum needed for plant photosynthesis. Since the human eye is most sensitive to colors plants don’t need such as green, and least sensitive to colors plants prefer, Lumens can’t be used to accurately compare the plant growing capability of LED grow lights. Here is an example that brings this idea to light. In movie production many scenes are filmed with a “green screen” background which later is filled in with whatever landscape is needed. The reason the screen is green is because this is the color most easily seen by the human eye. On the other hand, green plants reflect the green wavelength of the visible spectrum of light. G8LED lights sold by Dorm Grow LED do not have any green wavelength diodes as these are not the optimal wavelengths needed for photosynthesis of plants. This entry was posted in Flowering With LEDs, G8LED. Bookmark the permalink.